I need to highlight her because she such a classic. Many people have never read any of her works just because she isn't current. I can't tell you how current she really is! She has created the love themes in our favorite books and movies today. She is one of my very favorite writers and she writes romance like no one can! My favorite is Persuasion. Let me introduce you to Jane Austen. Biographical information concerning Jane Austen is "famously scarce", according to one biographer. Only some personal and family letters remain (by one estimate only 160 out of Austen's 3,000 letters are extant), and her sister Cassandra (to whom most of the letters were originally addressed) burned "the greater part" of the ones she kept and censored those she did not destroy. Other letters were destroyed by the heirs of Admiral Francis Austen, Jane's brother. 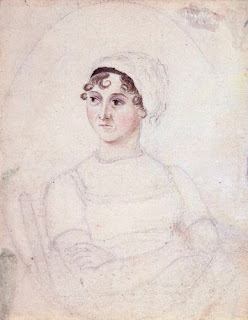 Most of the biographical material produced for fifty years after Austen's death was written by her relatives and reflects the family's biases in favor of "good quiet Aunt Jane". Scholars have unearthed little information since. Jane Austen was a major English novelist, whose brilliantly witty, elegantly structured satirical fiction marks the transition in English literature from 18th century neo-classicism to 19th century romanticism. Jane Austen was born on 16 December, 1775, at the rectory in the village of Steventon, near Basingstoke, in Hampshire. The seventh of eight children of the Reverend George Austen and his wife, Cassandra, she was educated mainly at home and never lived apart from her family. She had a happy childhood amongst all her brothers and the other boys who lodged with the family and whom Mr Austen tutored. From her older sister, Cassandra, she was inseparable. To amuse themselves, the children wrote and performed plays and charades, and even as a little girl Jane was encouraged to write. The reading that she did of the books in her father's extensive library provided material for the short satirical sketches she wrote as a girl. As a young woman Jane enjoyed dancing (an activity which features frequently in her novels) and she attended balls in many of the great houses of the neighborhood. She loved the country, enjoyed long country walks, and had many Hampshire friends. Never read any Jane Austen? It's time you did. She is AMAZING. Best love stories EVER. As you know, she is my favorite! So witty, so romantic, seriously great! I have all of the books on my bookshelf yet to read - which one should I start with? Jane definitely rocks. Cool feature. I adore Jane Austen - one of my favourite writers of all time. (Though I still haven't read Sense & Sensibility - *ducks* ). Did you every see 'Lost in Austen' ? That TV Series that was on about a year or two ago. That was like my dream come true. hehe. I'm so glad you featured our dear Jane!! I have read Persuasion and I love it. She was a incredible writer. Now I have Sense and Sensibility on my shelf waiting for me to read it. Wonderful blog and great post. I'm a big Austen fan as well. I love, love, love Pride & Prejudice and Persuasion. That love letter that Wentworth writes Anne is to die for.